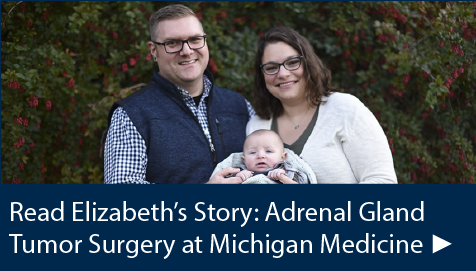 The Division of Endocrine Surgery at Michigan Medicine draws on a rich history to deliver modern care in the treatment of cancers and other diseases of the endocrine system. Through our research, we’re advancing understanding of how cancers develop, and through our training programs, we emphasize independence and in-depth learning to produce excellent future endocrine surgeons. As the first such division of our kind in the country, Endocrine Surgery at Michigan enjoys a strong legacy of advancements in the field. One of the our department’s greatest chairmen was Frederick A. Coller, M.D., a renowned thyroid surgeon and the namesake of the Coller Surgical Society. Today, we perform more than 1,000 endocrine surgery procedures each year, making us one of the most experienced teams in the country. Our clinical philosophy is threefold: Assemble the best multidisciplinary teams; harness the power of technology; and deliver effective and proven surgical techniques with compassion. Parathyroid disease: We’ve performed more than 3,500 parathyroid operations since 2000, offering treatment for both routine cases and the most advanced form of the disease. We’ve developed advanced techniques for monitoring parathyroid hormone production during surgery, and use both minimally invasive and open surgical approaches. Thyroid disease: As one of the largest endocrine surgical divisions in the U.S., our surgeons perform more than 500 thyroid surgeries a year, with a track record of lower complication rates and optimal patient outcomes. Adrenal disease: In their entire career, most doctors will never encounter a single case of adrenal cancer. University of Michigan adrenal specialists typically see 10 to 15 adrenal cancer patients each week. Our surgeons offer treatment for common conditions and the most advanced types of adrenal disease, including: adrenal cancer, Cushing's syndrome, adrenal nodules, and adrenal tumors. Endocrine cancer: The Multidisciplinary Endocrine Tumor Program at the University of Michigan is composed of endocrinologists, endocrine surgeons, radiologists, nuclear medicine specialists and oncologists who specialize in all aspects of diagnosis and treatment of endocrine conditions, including: familial neuroendocrine syndromes, pancreatic neuroendocrine tumors, and carcinoid and intestinal neuroendocrine tumors. We offer the Norman W. Thompson Fellowship in Endocrine Surgery, a 1-year clinical and integrated research program for board-eligible general surgeons who seek expertise in endocrine surgery. Our program emphasizes transitioning to clinical independence, with the fellow appointed as an instructor in the department to facilitate this growth. Our graduates consistently finish at or above the 98th percentile for endocrine surgery procedural experience, compared to other ACGME-accredited residencies. We also provide training to residents and fellows in other specialties, as well as medical students. Through decoding genetic mutations to investigating what stem cells can teach us, our endocrine surgery research teams are uncovering new insights into adrenal cancers and other disorders of the endocrine system. Understanding how mutations in adrenal stem cells or progenitor cells can lead to adrenal cancer. By studying the gene known as IGF2, we can see how mutations in this gene affect stem cells in the adrenal cortex. Using stem cells to better understand what can go wrong early in the development of adrenal cancer, a vital first step toward developing better treatments for this fatal disease. Developing new medicines for cancer to provide targeted treatment via new drug compounds.